The Perot Museum of Nature and Science located in Victory Park, near Downtown Dallas is said to be a “world of wonder” by The Dallas Morning News. Passing the test of school children, inspiring curiosity in all ages and boasting as a living science lesson, this new museum opened its doors to the public on December 1, 2012. Get ready to amaze your brain through hands-on learning experiences. The Perot Museum exposes our children to a world of ideas and concepts in science, math and technology, all within one spectacular location. By offering hands-on ways to learn about scientific evidence, mathematical concepts and natural history, the museum will profoundly affect what and how our kids experience science and nature. Through permanent exhibits and programming, and by hosting world-renowned traveling exhibitions, the Perot Museum has drawn international press and become a premier attraction for curious minds. The 180,000-square-foot facility provides youth the opportunity to explore new ideas through tangible, galvanic exhibits, where they’ll study everything from dinosaurs to DNA. Programming includes tactile exploration areas, discovery stations, workshops, demonstrations, lectures and symposia, field trips, labs, a teacher development center, after-school and summer classes, clubs, interactive media and more. 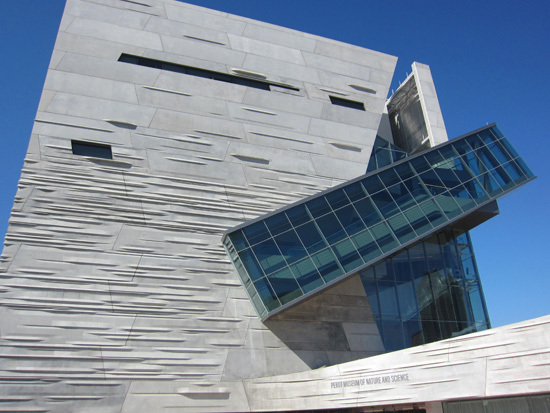 Online activities, interactive media and online education programs further extend the reach of the Perot Museum. The Perot Museum is a place where families can learn together and individuals can take a break from their daily routines to ponder the vast mysteries of science. Visitors can wander, either to get lost or to find their way, as they discover something new and fascinating. The museum can be reached by using DART’s bus and rail system. Visitors can take any of the rail lines to West End or Akard stations. The museum is several blocks north, at the intersection of Field Street and Woodall Rodgers Expressway. Visitors can also take a bus to the West Transfer Center and walk two blocks north from there. Routes 27, 29 and 183 pass alongside the museum. If coming from the Downtown Dallas area, you can take the FREE D-Link bus. You can find links to ticket information, hours of operation and directions here. This entry was posted in Destination DART, Uncategorized. Bookmark the permalink. The last sentence in paragraph 2 appears to have been edited out of context and needs review. Thank you, Cynthia, for alerting us to that strange copy. We’ve removed it from the post.